Until recently, I thought all pancake houses were pretty much the same. But then, a recent visit to the Original House of Pancakes in Irving/Las Colinas showed how badly mistaken I was. The Original Pancake House (founded in Portland, Oregon in 1953 by culinary experts Les Highet and Emma Huenekest) is a unique restaurant. They specialize in hand-crafted breakfast cakes. But, these are far removed from the rather bland and boring pancakes like most of us grew up eating. As I recall, whether made from a box or bought at a chain restaurant, pancakes had to be covered with syrup to be palatable. These made-from-scratch cakes stand on their own, no syrup needed! Although it should be noted they also make their own syrups in house. 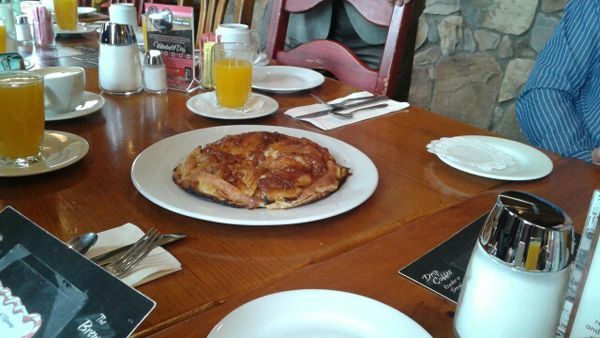 Case in point: OPH’s apple pancake, a light, fluffy, over-sized pancake stuffed with sauteed apples and sprinkled with cinnamon sugar for a savory glaze. This cake is large enough to feed two hungry people. A similar signature over-sized pancake is the Dutch Baby, baked with lemon, whipped butter and powdered sugar to achieve a delightfully tart taste. Add a glass of freshly squeezed orange juice, or a cup of coffee or tea, and these baked cakes would guarantee a delectable way to start anyone’s day. As owners of the new Irving OPH (their 7th location) Jonathan Soyoum and Mark Davis Bailey talked about honoring the founders’ traditions at a recent tasting brunch. Bailey said they take pride in maintaining the high standards that make their food outstanding. To achieve this goal, they use only the finest ingredients. These include 93 score butter, 36% whipping cream, fresh grade AA eggs, hard wheat unbleached flour and a secret sourdough starter recipe to make their batters. It takes as long as four days to produce one of their pancakes. These pancakes range from ancient grain to buttermilk or blueberry and other fruit flavors. Light and airy Swedish pancakes and minced potato pancakes served with sour cream or cinnamon applesauce are also on the menu for $8.19-$8.39. Buttermilk pancakes are $6.99 and plate-sized 49’er Flap Jacks are $8.09. They also have a lunch menu that serves sandwiches. Choices include grilled ham and cheese, BLTs, chicken salad, club, and a new turkey avocado wrap. The basil wrap features a blend of cream cheese, green onions, mustard, honey and jalapeno dressing. Plus turkey, Swiss cheese, letter, tomato, avocado and bacon, all for $8.69. Soups and salads are also on the lunch menu. For a really scrumptious dessert, Original Pancake House offers French crepes made with fresh strawberries. Coffee Maple Banana Crepes and Cherry Kijafa are also featured, as shown. This delicacy was simmered in Cherry Kijafa Wine sauce and topped with Montmorency cherries, priced at $8.59. I was especially impressed by the large variety of omelets including a veggie omelet. There’s also an oven-baked mushroom omelet topped with a rich mushroom sherry sauce. An egg dish with special appeal for those who love a hearty breakfast was the Country Style Benedict. This unique twist paired two scrambled eggs and two sausage patties topping a “down home” style biscuit, all smothered in cream gravy. The new Original Pancake House at 510 Lyndon B. Johnson Freeway in Irving serves breakfast all day, starting at 6:30 a.m. M-F or 7 a.m. weekends, with lunch from 11 am to 2 pm (3 pm on weekends). Any of their breakfast goodies can also be enjoyed throughout the day, which is always good news for breakfast lovers like me.